For the process of suppressing or extinguishing a fire, see Fire control. A German anti-aircraft 88 mm gun with its fire-control computer from World War II. Displayed in the Canadian War Museum. A fire-control system is a number of components working together, usually a gun data computer, a director, and radar, which is designed to assist a weapon system in targetting, tracking and hitting its target. It performs the same task as a human gunner firing a weapon, but attempts to do so faster and more accurately. The original fire-control systems were developed for ships. Then increasingly sophisticated mechanical calculators were employed for proper gun laying, typically with various spotters and distance measures being sent to a central plotting station deep within the ship. There the fire direction teams fed in the location, speed and direction of the ship and its target, as well as various adjustments for Coriolis effect, weather effects on the air, and other adjustments. Around 1905, mechanical fire control aids began to become available, such as the Dreyer Table, Dumaresq (which was also part of the Dreyer Table), and Argo Clock, but these devices took a number of years to become widely deployed. These devices were early forms of rangekeepers. Unmeasured and uncontrollable ballistic factors, like high altitude temperature, humidity, barometric pressure, wind direction and velocity, required final adjustment through observation of the fall of shot. Visual range measurement (of both target and shell splashes) was difficult prior to availability of Radar. The British favoured coincident rangefinders while the Germans favored the stereoscopic type. The former were less able to range on an indistinct target but easier on the operator over a long period of use, the latter the reverse. Ford Mk 1 Ballistic Computer. The name rangekeeper began to become inadequate to describe the increasingly complicated functions of rangekeeper. The Mk 1 Ballistic Computer was the first rangekeeper that was referred to as a computer. Note the three pistol grips in the foreground. Those fired the ship's guns. 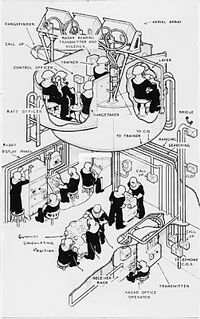 Submarines were also equipped with fire control computers for the same reasons, but their problem was even more pronounced; in a typical "shot", the torpedo would take one to two minutes to reach its target. Calculating the proper "lead" given the relative motion of the two vessels was very difficult, and torpedo data computers were added to dramatically improve the speed of these calculations. Accurate fire control systems were introduced in the early 20th century. Pictured, a cut-away view of a destroyer. 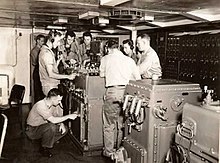 The below deck analog computer is shown in the centre of the drawing and is labelled "Gunnery Calculating Position". The performance of the analog computer was impressive. The battleship USS North Carolina during a 1945 test was able to maintain an accurate firing solution on a target during a series of high-speed turns. It is a major advantage for a warship to be able to maneuver while engaging a target. Night naval engagements at long range became feasible when radar data could be input to the rangekeeper. The effectiveness of this combination was demonstrated in November 1942 at the Third Battle of Savo Island when the USS Washington engaged the Japanese battleship Kirishima at a range of 8,400 yards (7.7 km) at night. Kirishima was set aflame, suffered a number of explosions, and was scuttled by her crew. She had been hit by at least nine 16-inch (410 mm) rounds out of 75 fired (12% hit rate). The wreck of Kirishima was discovered in 1992 and showed that the entire bow section of the ship was missing. The Japanese during World War II did not develop radar or automated fire control to the level of the US Navy and were at a significant disadvantage. The last combat action for the analog rangekeepers, at least for the US Navy, was in the 1991 Persian Gulf War when the rangekeepers on the Iowa-class battleships directed their last rounds in combat. Figure 2. A conceptual diagram of the flow of fire control data in the Coast Artillery (in 1940). The set forward point of the target was generated by using the plotting board (1). This position was then corrected for factors affecting range and azimuth (2). Finally, fire was adjusted for observations of the actual fall of the shells (3), and new firing data were sent to the guns. ^ a b c A. Ben Clymer (1993). "The Mechanical Analog Computers of Hannibal Ford and William Newell" (pdf). IEEE Annals of the History of Computing. 15 (2). doi:10.1109/85.207741. Retrieved 2006-08-26. ^ "Chronology of the USS Monitor: From Inception to Sinking". The Mariner's Museum. USS Monitor Center. Archived from the original on 2006-07-13. Retrieved 2006-08-26. ^ The increasing range of the guns also forced ships to create very high observation points from which optical rangefinders and artillery spotters could see the battle. The need to spot artillery shells was one of the compelling reasons behind the development of naval aviation and early aircraft were used to spot the naval gunfire points of impact. In some cases, ships launched manned observation balloons as a way to artillery spot. Even today, artillery spotting is an important part of directing gunfire, though today the spotting is often done by unmanned aerial vehicles. For example, during Desert Storm, UAVs spotted fire for the Iowa-class battleships involved in shore bombardment. ^ See, for example US Naval Fire Control, 1918. ^ Mindell, David (2002). Between Human and Machine. Baltimore: Johns Hopkins. pp. 25–28. ISBN 0-8018-8057-2. ^ The reasons were for this slow deployment are complex. As in most bureaucratic environments, institutional inertia and the revolutionary nature of the change required caused the major navies to move slow in adopting the technology. ^ For a description of an Admiralty Fire Control Table in action: Cooper, Arthur. "A Glimpse at Naval Gunnery". Ahoy: Naval, Maritime, Australian History. ^ The degree of updating varied by country. For example, the US Navy used servomechanisms to automatically steer their guns in both azimuth and elevation. The Germans used servomechanisms to steer their guns only in elevation, and the British began to introduce Remote Power Control in elevation and deflection of 4-inch, 4.5-inch and 5.25-inch guns in 1942, according to Naval Weapons of WW2, by Campbell. For example HMS Anson's 5.25-inch guns had been upgraded to full RPC in time for her Pacific deployment. ^ The rangekeeper in this exercise maintained a firing solution that was accurate within a few hundred yards (or meters), which is within the range needed for an effective rocking salvo. The rocking salvo was used by the US Navy to get the final corrections needed to hit the target. ^ Jurens, W.J. (1991). "The Evolution of Battleship Gunnery in the U.S. Navy, 1920–1945". Warship International. No. 3: 255. Archived from the original on 2006-11-20. Retrieved 2006-10-18. ^ Anthony P. Tully (2003). "Located/Surveyed Shipwrecks of the Imperial Japanese Navy". Mysteries/Untold Sagas Of The Imperial Japanese Navy. CombinedFleet.com. Retrieved 2006-09-26. ^ Mindell, David (2002). Between Human and Machine. Baltimore: Johns Hopkins. pp. 262–263. ISBN 0-8018-8057-2. ^ "Older weapons hold own in high-tech war". Dallas Morning News. 1991-02-10. Retrieved 2006-09-30. ^ "BLOW HOT-BLOW COLD - The M9 never failed". BELL LABORATORIES RECORD. XXIV (12): 454–456. Dec 1946. ^ Baxter, "Scientists Against Time"
^ Bennett, "A History of Control Engineering"
^ For early background, see "Fire Control and Position Finding: Background" by Bolling W. Smith in Mark Berhow, Ed., "American Seacoast Defenses: A Reference Guide," CDSG Press, McLean, VA, 2004, p. 257. ^ See for example, the write-up on Fort Andrews in Boston Harbor for a summary of artillery assets and fire control systems typical of these defenses. ^ For a complete description of fire control in the Coast Artillery, see "FM 4-15 Coast Artillery Field Manual-Seacoast Artillery Fire Control and Position Finding," U.S. War Department, Government Printing Office, Washington, 1940. Wikimedia Commons has media related to Fire control systems. Baxter, James Phinney (1946). Scientists Against Time. Little, Brown and Company. ISBN 0-26252-012-5. Frieden, David R. (1985). Principles of Naval Weapons Systems. Naval Institute Press. ISBN 0-87021-537-X. Friedman, Norman (2008). Naval Firepower: Battleship Guns and Gunnery in the Dreadnought Era. Seaforth. ISBN 978-1-84415-701-3. Pollen, Antony (1980). The Great Gunnery Scandal — The Mystery of Jutland. Collins. ISBN 0-00-216298-9.